The weather was once again kind to us on Sunday morning at our home track in Narrogin . Thirty-three brave souls turned out for a perfectly prepared track – aside from the dust. With the water truck out early to lay some moisture on the track, racing was under way by 10.00 am. 125s were low in numbers. 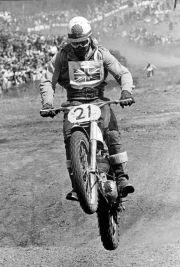 The racing was fast and furious, the lead changing on numerous occasions with very old campaigner Stewy Aldred proving he still has it when his bikes are going. Young Thomas Lawson and Stewy changed places at the pointy end over the day. There were 12 250s on the start line with multiple winners on the day. Andrew Irving and Mike Godbold took out most of the races and many others tried hard to match them for pace. There was great racing among the rest of the field. Open Class had Rod Gilchrist showing everyone a clean pair of heals all day. Brad Green and Scott Lawson both pushed hard to catch the leader and had their own tussle racing for the other positions. Sidecars only had two units for the day so they turned it into a training day. The pairing of Gary (the Legend) Johnson and Bradley (the feral) Green showed the ropes to Andrew (is my hair all right) Irving and his new passenger Nick (my pants won’t stay up) Ferguson. Nick showed much promise and is full of enthusiasm. Looks like we found another great passenger and member. When they raced the pairing of Johnson and Green had it over Irving and Ferguson because the young starter girl was Brad’s girlfriend and she told them that when she lifts her left bum cheek she would pull the trigger. This made Gary miss the starts because he was too busy looking at her bum cheek. Over 55s – once again another great race for those that could remember where the start line was – it happens when they get old. They all charged into the first corner then realized that they best slow down before they hurt themselves. The likes of Alan Mitchell and Geoff Davison were having an absolute ball at the front of the field with Stan Reed and Barry Mitcheson swapping places in the minor positions. The last race of the day was the all in handicap, I am not sure who won as newcomer Nick Ferguson had a big off at the end of the back straight. His mate Brad Green was the next along and stopped to help. He said he found him on the ground in the fetal position sobbing and asking for his mum. The next person to turn up was Gary Johnson and Brad heard Gary say in a caring voice, ‘you had better not have damaged the bike’as Nick was riding one of Gary’s. Anyway after all that he was OK accept for a few lumps and bumps. We would like to thank the flaggies, starters and those involved with running the day for putting of such a fabulous weekend.